I’ve been making this recipe since my friend Julie started a restaurant in the mid-1990s. 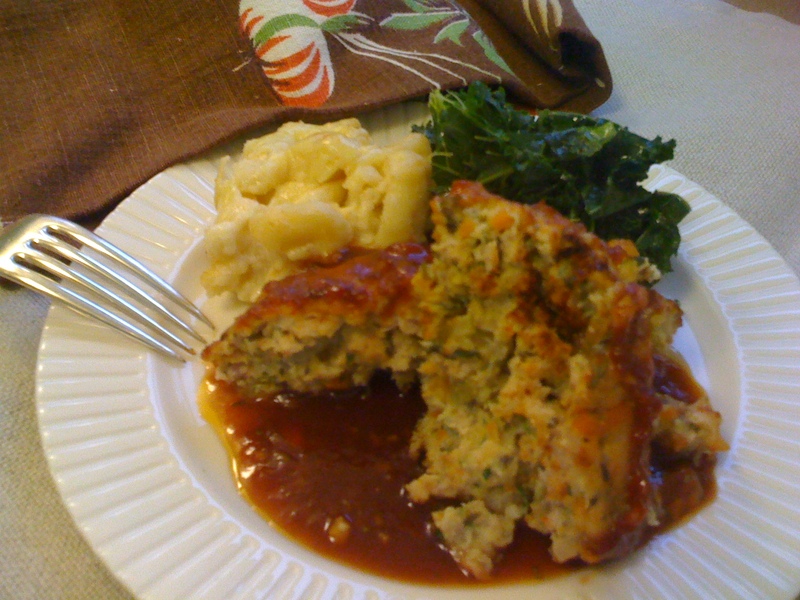 I worked with her for a couple of months, and she shared some of her recipes with me, including this one for Turkey Meatloaf. I’ve made this many times for my family and friends as well as for clients (one of whom requested that I post this on the blog). The barbecue sauce has a nice ginger flavor that complements the vegetables and herbs in the meatloaf. Chopping all of the vegetables and assembling the ingredients takes about half an hour, and then you cook it in the oven for an hour. It makes good leftovers, but we rarely have them at my house. 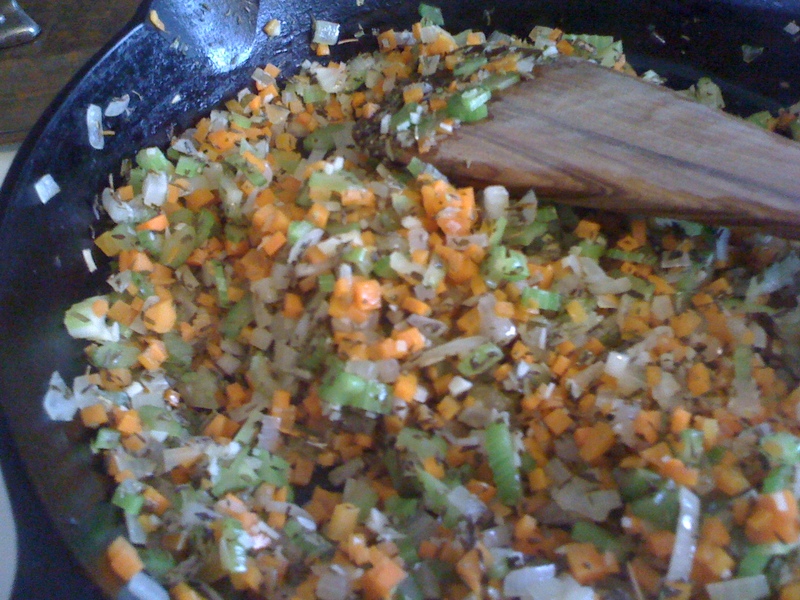 Sauté onions, carrots and celery in olive oil 0ver medium heat until onions are translucent. Add garlic, and sauté for about 1 minute more. Stir in dried herbs, and turn off heat. In a large mixing bowl, combine mustard, Worcestershire sauce, cayenne, milk, eggs, salt, and pepper, and mix well. Add vegetables and remaining ingredients to the bowl and mix it all up. Tina’s Tip: Instead of buying pre-packaged ground turkey, I get it directly from a butcher (or from the meat department at a specialty grocery store) and I specify ground breast meat. Form into a loaf shape on a sheet pan lined with parchment paper. 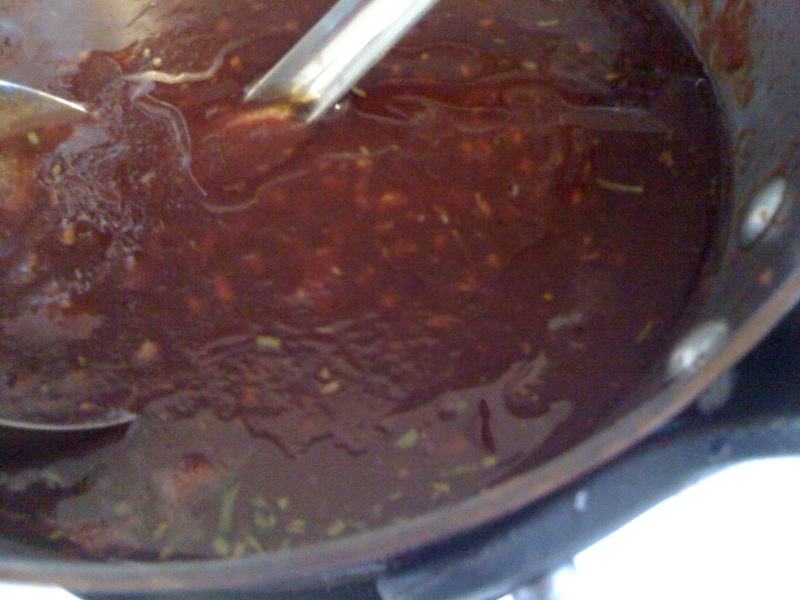 Ladle Ginger Barbecue Sauce (below) over the loaf (make sure it is covered well). Bake for 1 hour at 350 degrees F.
Tina’s Tip: I make the sauce (below) first and let it simmer as I am preparing the meatloaf. The recipe makes more sauce than you will probably need for your meatloaf, but it keeps well in the refrigerator for up to a month. Combine all ingredients in a small saucepan over medium-low heat. Simmer for 10 minutes. If it starts splattering, turn off the heat or lightly cover with a lid. Set aside until meatloaf is ready. Tina’s Tip: To make this gluten free, simply substitute gluten-free bread crumbs and Worcestershire sauce (available at many grocery stores, including Whole Foods) in the meatloaf, and use gluten-free soy sauce in the Ginger Barbecue Sauce. This entry was posted in Poultry, Recipes and tagged Dinner, Recipe, Sauce, Turkey. Bookmark the permalink. What a great variation – much healthier too.